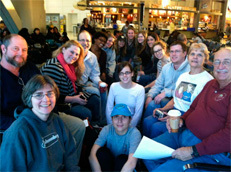 On January 7, 2012, sixteen Limestone Church members and friends (photo at Newark airport) left for a nine-day mission trip to Honduras. The group will work in a rural mountain community named San Francisco for a week, under the direction of Tim and Gloria Wheeler, the mission workers that our church supports in Honduras. The Wheelers work for both the Presbyterian Church (USA) and Heifer Project International. 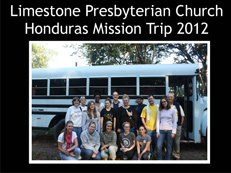 They have visited Limestone and have led a program here on their mission work in Honduras. Pastor Carolyn Gillette, who is organizing the trip, has led eight mission trips to Honduras, all hosted by the Wheelers. Our church group will work side by side with members of a rural community near Copan to dig and pour foundations for houses and to make cement blocks to be used in construction. The doctor and nurse who are going on this mission trip will be providing a medical clinic for the community and surrounding area. Our mission trip team took with them two hundred pounds of Spanish books for children as part of Catherine Gillette’s Children Are Reading, Earning, Succeeding (C.A.R.E.S.) project. Their luggage also took more solar BOGO flashlights to give people there. The solar lights that our previous mission trip group took have been very popular in rural Honduras and make a good connection to our church with solar panels on our sanctuary roof. The team also took funds raised to help those in Honduras; including funds from the special baptism offerings that Limestone Presbyterian Church has in honor of children being baptized that are given to help other children in need. Sixteen of us will leave from Newark Airport and fly to San Pedro Sula, Honduras. Honduras is the second poorest country in the Western Hemisphere. Please pray for Tim and Gloria Wheeler, who work for the Presbyterian Church (USA) and Heifer Project International; they will be our hosts. We will travel to a rural mountain community of about sixty families where we will spend the week. Though the community is very poor, it is in a very beautiful location, with mountains and trees all around. Please pray for people who work to protect the environment in Honduras, and for Deacon Meghan Gloyd*, a team member who is studying for her Master's Degree in environmental concerns at the University of Delaware. Pray also for Pastor Carolyn Gillette*, who is leading this mission trip. Much of our work this week will be digging foundations (with shovels), mixing cement, and making concrete blocks one at a time with a block press. Please pray for Tim Sherry, a building contractor in our group. Pray also for Rebecca Sherry and Dwayne Pragg, some of our (16!) hard workers, and for the Hondurans with whom we will be working to build houses. An emergency room physician, Frank Lasala, and a nurse, Karen Zecher* (Limestone's Parish Nurse), are part of our mission team and will be working to provide medical care to folks in the community as well as to those in our group. Please pray for Frank and Karen, for safety and good health for our group, and for the many people in Honduras who have almost no access to medical care. Also, pray for Monica Vilacha and Molly Rue, two bilingual graduate students from the University of Delaware, who will serve as interpreters for the medical team and the construction crew throughout the week. Each night we will sleep in a school building. Air mattresses and sleeping bags on a concrete floor will seem like a gift at the end of each long, hot day. Neighborhood roosters will wake us up each morning. Please pray for those in Honduras who have inadequate housing. Also, pray for Elizabeth Grim (who works with Meeting Ground homeless ministry when she is not in Honduras), and Reneice Charles*. Pray also for Catherine Gillette* and a reading project, C.A.R.E.S. (Children are reading, earning, succeeding) that Catherine has been working on this past year with the Wheelers, helping children in one rural school to have books to read and incentives to read them. Thursday is near the end of a long, hard work week of sweating in the sun. By this time in the week, it is often hard to get excited about going to the work site and digging, mixing cement, and carrying blocks for one more day. Pray for all of us-for strength and perseverance and a joyful attitude. Please pray for Emma Newkirk and Sarah Gillette*, two of our many (16!) enthusiastic participants on the trip. Today we will leave the community and travel back to Copan, the tourist town where we started the week, to begin our journey home. This trip is sponsored by Limestone Church's Mission Committee; we are grateful that our most recent mission committee chairperson, Elder Roger Cooper*, as well as our current mission chairperson, Elder Sarah Pragg*, are participants on this trip. Please pray for Roger and Sarah. Today, in addition to seeing the Mayan Ruins, some members of our group will visit Urban Promise Honduras and see the school where Catherine Gillette worked last summer. This is a good day for participants to reflect on what our mission trip experience has been. Someone in Honduras once told one of our mission teams, "You aren't here on vacation. God has sent you here for a reason. Your job is to figure out how this trip will change your life and help you to be more faithful to God". Please pray that all of us on the trip - and our churches back home -- may work to make God's world a more just and fair place for everyone. Today we leave early in the morning for the drive back to the airport. Please pray for safe travels as we drive to San Pedro Sula and then fly home. Why do we send people on a mission trip instead of just sending money? 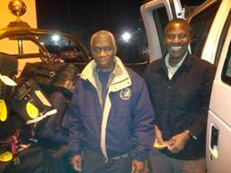 Special thanks to the Ghanaian Presbyterian Fellowship that rented a large van and took our Mission Trip Team from Wilmington, Delaware to Newark, New Jersey. The photo is of Ghanaian leaders Mawuna Gardesey and Ebenezer Kotei.